Should have asked the neighbors for their sign. 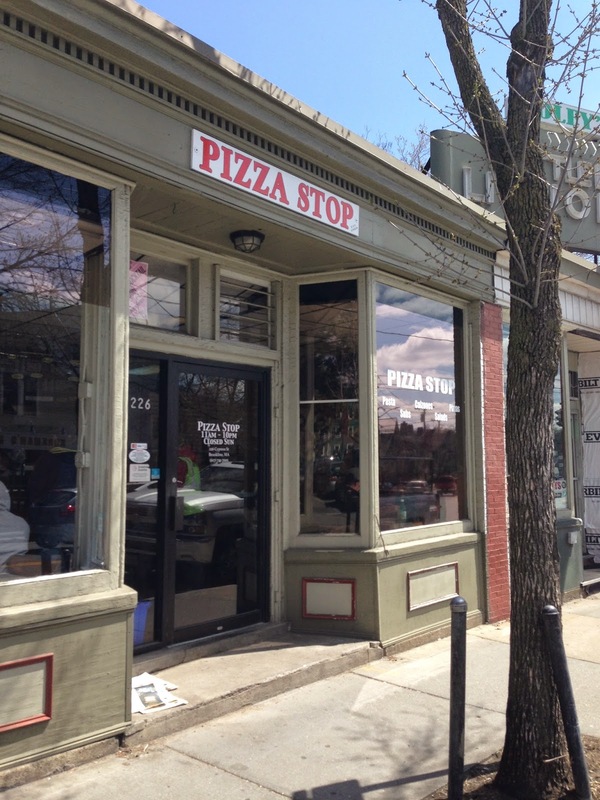 Off of Boylston St., Brookline becomes a blur of winding dead-ends and hills, but tucked between a bank and a packie, you will find Pizza Stop on Cypress St. With an unadorned sign above the door, Pizza Stop blends into the surrounding area, and it takes some insider knowledge to discover the place. This insider knowledge seems to run wild in these hills as the Stop was jam packed on this sunny Friday afternoon with folks dying to chow down on some slices and subs. The staff here greets customers with a friendly yet confident tone. They're all business at the Pizza Stop, and they call out orders with speed, regularity, and efficiency in their open, three-man pizza kitchen. Yet despite its name, the Pizza Stop is known and recommended for its subs: specifically, the steak and cheese. 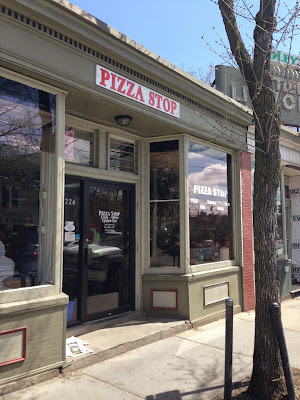 Available as a steak and cheese, steak and onion, steak and pepper, steak and mushroom, etc., Pizza Stop follows the Mass steak and cheese nomenclature where the other ingredients, be it onions, mushrooms, peppers, takes precedence over cheese in the name. 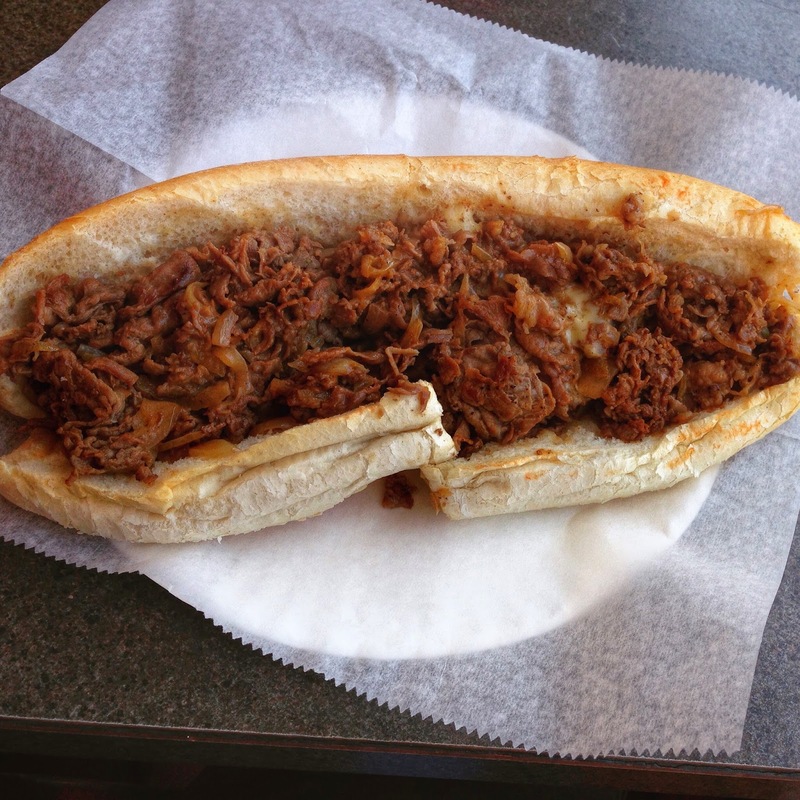 Following Philly cheesesteak logic, I translated a "cheesesteak wit[h onions]" to a "steak and onion." A large steak and cheese plus a drink rang in at just under $10, which is fair but no bargain. The sub comes served steaming on a paper plate on top of parchment paper, and one of their three or four tables opened up just in time to take a bite and film a review. Served on a 12" roll, the steak and cheese comes out steaming hot. The fresh, thinly shaved steak is chopped on the griddle with cheese and finely sliced onions mixed in. Most importantly, Pizza Stop cooks its steak and cheese properly: they add the cheese to the steak on the griddle, then mix the ingredients together so the cheese melts and mingles with the shaved steak. The hot, gooey mixture is then evenly placed into the soft sub roll so each bite is even and delicious. Philly knows this well, yet Mass certainly does not. Even the "great" Steak and Cheeses here are often cooked steak on top of or underneath cold, sliced cheese that melts insufficiently. Bottom line, Pizza Stop gets it right. The steak and cheese is on point, and it is one of the best around. The roll, however, is standard and very soft. A slightly crustier roll would have pushed this sub up into the elite range, but all things considered, it's a great steak and cheese with a good, soft roll that holds its ingredients well. Where's your favorite Steak and Cheese Sub? Do you have anything to say at all? Anything? 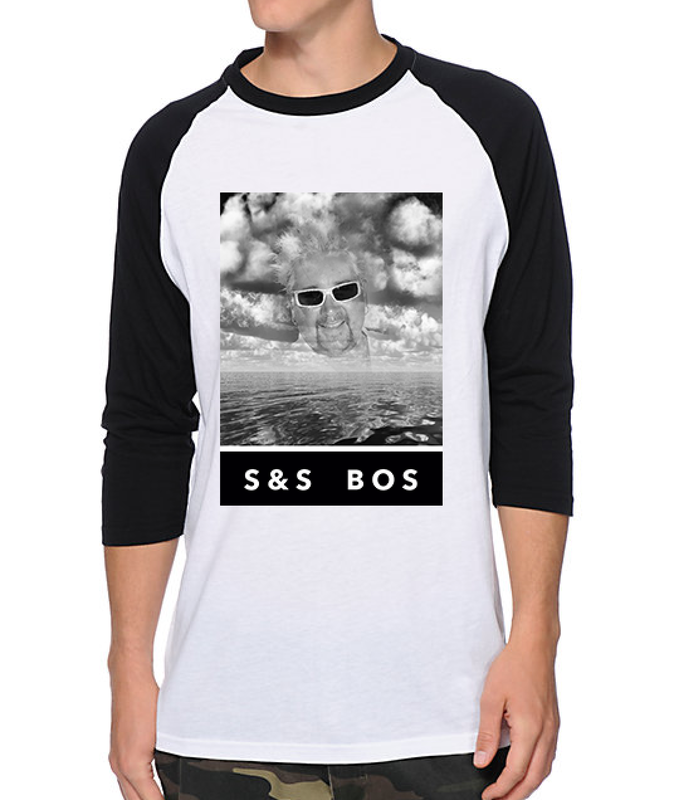 If you do or have eaten anything at all anywhere, send in your pictures, videos, recommendations, and one-bite reviews to the Submarine Savages at subsandstuffbos@gmail.com and add/message us on Twitter (@subsandstuffbos), Instagram (@subsandstuffboston), and Facebook. Before you do that, check out the The Deli aka the new Subs and Stuff Store where you can by exclusive, designer Subs and Stuff official gear like a stylish savage and stuff.